Propofol Infusion Syndrome, often shortened to PRIS, is a rare syndrome which affects patients undergoing long-term treatment with high doses of the anaesthetic and sedative drug propofol. Propofol Infusion Syndrome can lead to cardiac failure, rhabdomyolysis (direct or indirect muscle injury), metabolic acidosis and kidney failure. It is often fatal. High blood potassium, high blood triglycerides and liver enlargement (fatty liver) are thought to be caused by either 'a direct mitochondrial respiratory chain inhibition or impaired mitochondrial fatty acid metabolism' are also key features. 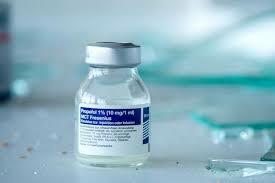 The syndrome is associated with high doses and long-term use of propofol (> 4 mg/kg/h for more than 24 hours). It occurs more commonly in children and critically ill patients. Patients receiving catecholamines and glucocorticoids are at high risk. Treatment is supportive. Haemodialysis or haemoperfusion are potential treatments. Early recognition of the syndrome and discontinuation of the propofol infusion reduces morbidity and mortality. Propofol was only introduced in 1986. Propofol's abuse potential emerged quickly in the US and was highlighted by the death of pop singer Michael Jackson in 2009.